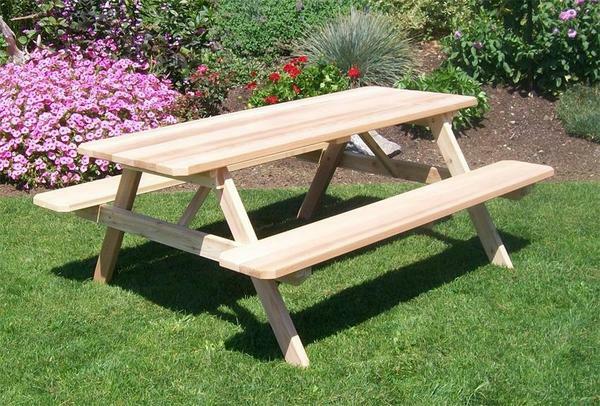 Let the Amish Western Red Cedar Table with Attached Benches host your outdoor parties, meals, games and more! This is the perfect cedar outdoor furniture for your home. With attached benches and your choice of options, you can't go wrong with this outdoor set. For those beautiful spring days and cool fall nights, select the outdoor furniture that will work for you and is made to last. This outdoor table and benches comes to you from an Amish wood shop in Pennsylvania, where all the focus is on creating the strongest, most durable and beautiful furniture for families. View more of our lovely outdoor furniture selections from our Amish Garden Furniture Collection. We are always happy to answer your questions. Email us today or call 1-866-272-6773 to speak with an Amish Furniture Representative.